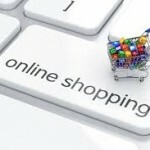 Following these simple e-commerce tips can help boost your online retail sales. In a recent interview with Venture Capitalist Hunter Walk, Lee Zalben of Peanut Butter & Co. discussed his formula for growing from one retail location into an e-commerce powerhouse. The cornerstone of his two-way communication with customers is recipes. His company creates its own content to market their peanut butter products, but it is the multiplication of these efforts through the creative recipes of customers that is the gas on the fire. Now, what’s so revolutionary about that – food + recipes? Nothing. But the broader lesson is that any brand, in any industry is just an ingredient in their customers’ lives. Your product is an ingredient in the outfit recipe, the room recipe, or the morning routine recipe. Simply ask customers what “recipe” they are creating with your product. “Show us the room where you put our table,” or “Show us what you’re wearing our tie with.” People like to share, but they need a little encouragement. This is one of the most important e-commerce tips that retailers can follow for engagement. The “thank you” adds a personal touch to your brand to separate you from everyone else who is not doing it (especially mass-merchants). The “check-in”, however, can lead in many beneficial directions including by opening up a conversation with customers. Benefits include: a) heading off a complaint, b) getting specific product feedback, and c) facilitating sharing and referrals. What does the long view mean in e-commerce? It means micro-conversions. You certainly hope new visitors simply click on a product right away and become a customer. However, that only happens a few percent of the time. So rather than view shopping visits as 95% bad and 5% good, use micro-conversions to change your positive outcomes to 25% or maybe even 50%. Your goal is to get permission from these new shoppers to talk to them in the future. The most common way is through email signups. Another popular way is to get visitors to follow you on social media. So make those things easy for them as they browse across your site. Also, make it easy for them to pin and share product images, your logo and your story. Lastly, let visitors create wishlists and make it really easy to give feedback or ask a question – more micro-conversions. Now that you have a growing audience who has granted you permission, it’s time to learn how to convert them into big buyers. The first thing to recognize is they are not a monolithic group. They are lots of mini-segments of tastes and styles and behavior. The trick is to split them up based on the behavior you’ve noticed from them into segments (there are tools for this). Then, it’s time to craft different communications for each one and test and measure, test more and measure more until you’ve found the secret sauce for each segment. For businesses engaged in global trade or those just considering an international strategy, it is critical to research and assess the economic, social and political conditions of potential new markets as well as the trade policies, history and outlook of your home country. In this post and in following segments, we will take a closer look at key markets across the globe. Free trade agreements have helped fuel business growth, raising living standards here in the United States and allowing American families to gain access to affordable goods and services. Ultimately, by removing barriers to trade, these agreements have allowed even the smallest U.S. companies to compete and thrive on a global scale, gaining access to some of the 95 percent of consumers who live outside of our borders. The United States has free trade agreements currently in force with 20 countries. While the U.S. economy is the largest in the world, meaning that the domestic flow of goods often takes precedence due to sheer size, international trade is a critical component of the economy. 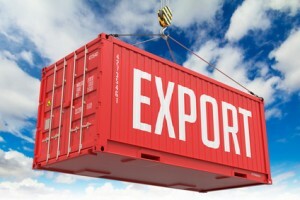 According to the U.S. Department of Commerce and the , Small Business Administration trade accounts for 30 percent of the U.S. economy, and U.S. exports of goods and services reached $2.3 trillion in 2014. We are celebrating 13 years this year. We started our business in 2003. Thanks a million for letting us take care of you! Our job would not be complete without your acquaintance. Goods shipped may incur Duty and VAT when shipped to international destinations. 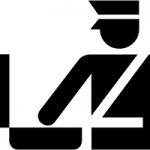 Customs Duty is a tariff or tax imposed on goods when transported across international borders. The purpose of Customs Duty is to protect each country’s economy, residents, jobs, environment, etc., by controlling the flow of goods. VAT is (similar to Sales tax in US) a consumption tax assessed on the value added to goods and services. This national/local tax applies more or less to all goods and services that are bought and sold for use or consumption in the Community. Total amount of Duty and VAT varies based on the destination country, nature of the product (Harmonized Code), country of manufacture and value of the product. There is no way to predict this value ahead of time. eCommerce retailers must bring clarity: Most eCommerce retailers clarifies in their terms and conditions that the person receiving a shipment is obliged to pay Duty and VAT. In some cases, the shipped can choose a private carrier (FedEx, UPS or DHL) and send a shipment to cover the cost of duties and VAT. In such situation, the shipper gets billed later once the Duty and VAT gets calculated and product delivered. The sender does not have any option to pay Duty and VAT when shipping smaller consumer related items via USPS. Duty and VAT, if applicable, must then be covered by the person receiving the shipment. Individuals buying products from US should be careful about these extra charges and must read the supplier’s website on the responsibilities for covering these charges. Calculating duties/taxes: Customs officials use a shipment’s declared value (the value the shipper declares on the goods being shipped), along with the description of the goods, to determine duties and taxes. It is important to ensure that the declared value claimed is accurate. Inaccurate declared value is one of the most prevalent reasons for duty and tax disputes. A shipment’s declared value represents the selling price or fair market value of the contents of the shipment, even if not sold. The first step in determining duty and tax information is to identify the product classification number, i.e. Harmonized System or Schedule B number for your product. More importantly, your goods won’t ship without this number on key shipping documents. A Schedule B number is a 10-digit number used in the United States to classify physical goods for export to another country. The Schedule B is based on the international Harmonized System (HS) of 6-digit commodity classification codes. 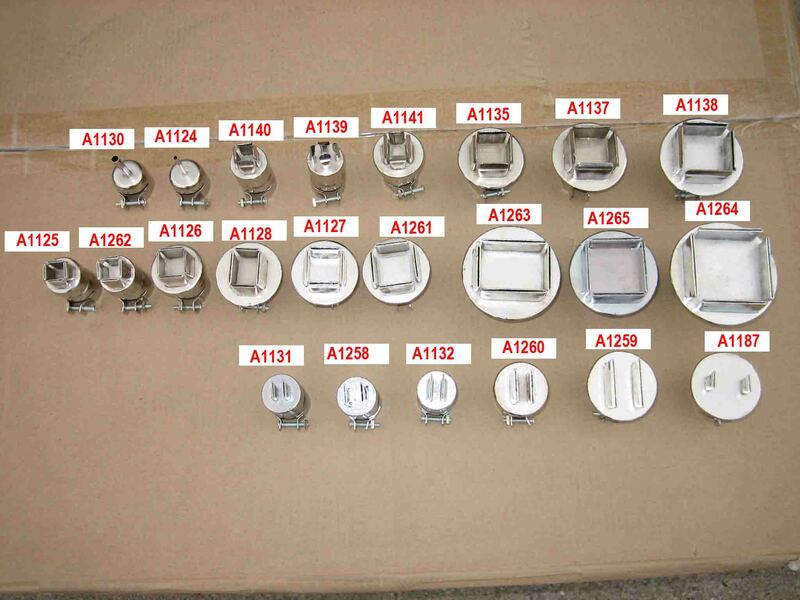 There is a Schedule B number for every physical product, from paperclips to airplanes. The Census Bureau sponsors a free online tool called the Schedule B Search Engine. Each country’s government that list tariff (duty) rates by each product’s harmonized System code. 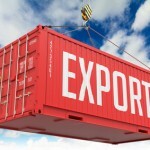 you may visit export.gov to get the latest publication and details. It is best to check with your shipper or fulfillment service provider to assist you with this research. Products manufactured in US has advantage: Some countries have very high duties and taxes; some have relatively low duties and taxes. If your product is primarily made in the U.S. of U.S. originating components it may qualify for duty-free entry into countries with which the U.S. has a free trade agreement. US currently have free trade agreements with more than 20 countries including Canada and Mexico. Targeting “Free trade agreement” countries is a good market entry strategy because buyers pay less tariff for goods made in the U.S. compared with similar goods from countries without “Free trade agreement”. Country of manufacture, therefore, must be stated when preparing “bill of lading”. Products manufactured in China or India but shipped from US do not qualify any advantage of “Free trade agreement”. The largest business and industry show in Nebraska and the Midwest — the 26th Biennial Omaha Products Show for Business & Industry is coming to Omaha this year —- on Sept 2-3, 2015 at the CenturyLink Center Omaha. 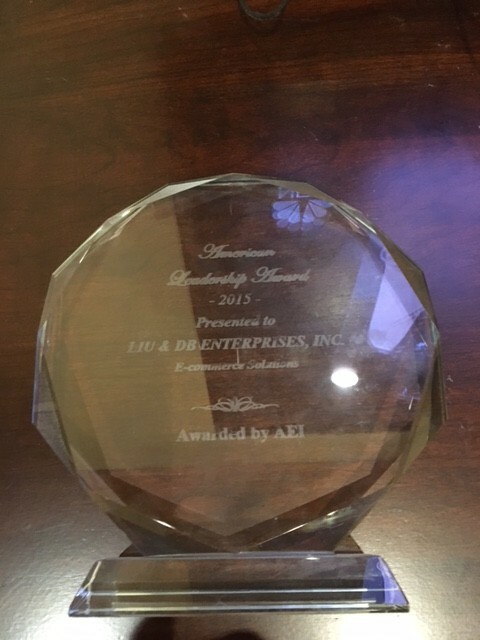 Plan to showcase your Company! You can do a seminar for free!! Get in NOW or let companies you know about the show! The show is sponsored by the Institute of Supply Management (the buyers from the top 300 plus companies in Nebraska). They have a booth at the show and join them at the Opening Luncheon! The Society of Manufacturing Engineers have a booth and are at the show. Join them as they and Downtown Omaha Inc host the Wed complimentary Exhibitor Reception. The Nebraska Chamber of Commerce is at the show. Join them and President Barry Kennedy at the Wednesday Opening Luncheon! The show is a business and industry show — office products, office supplies, construction , buildings, staffing, career info, printing, packaging, education, trucking, machine tools, forklifts, industrial, engineering, robotics, machinery, etc…. are all a part of the show. There is a Job & Career Pavilion – sponsored by OmahaJobs.com, a Health & Wellness Pavilion, and a Technology Pavilion. Don’t be left out! Do you want to meet new clients and customers? Increase sales? Low cost and easy payback and ROI. Save gas, save time, and save money by being at the show. All at one place and one location — the Omaha Products Show - Sept 2-3, 2015 at the CenturyLink Center Omaha! The Omaha Products Show for Business and Industry exists to help your business increase leads and sales. Gain valuable exposure, connect with new customers face to face, generate new leads and sales. Maximize your investment by putting on a seminar, be a sponsor, use social media to have prospects come see you at the show, increase your name recognition, brand, and leads through networking and meeting others. Be a part of the excitement at the 26th Biennial show. The place to be in Omaha and the Midwest on Sept 2-3, 2015 at the Centurylink Center! One booth is only $550.00. 10% discount on the 2nd booth and for 3 or more booths – bulk rate discount. See the web site for the newsletters, application form, and other info. www.showofficeonline.com. We hope all is going well with you. Let us know if you are interested or would like more information on the Omaha Products Show. Thanks in advance. 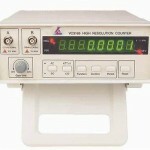 Frequency, period and equal-precision measurement. Range from 0.01Hz to 2.4GHz. 3) Resolution: depends on gate time control setting. Packing list: Manual, power cord and test probe. YOUR ONE-STOP SOURCE FOR RHINESTONE BEADS. 12 10mm Swarovski Rhinestone Bead Silver/Crystal RH1001A set of 12 Dazzling Rhinestone Filigree beads. 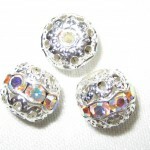 These are 10mm beads with crystal stones on a silver-plated filigree metal base, and with a nice thru-hole ideal for beading. The stones which are set in this quality finding are machine cut and fire polished – foiled back – to give extra rich sparkle. Add elegance and sparkle to your jewelry, crafts, ornaments or costumes designs! 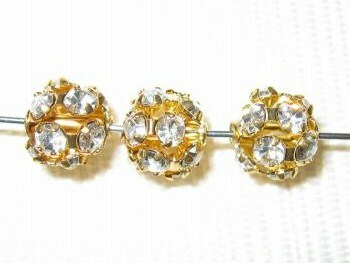 12 10mm Swarovski Rhinestone Beads Gold/Crystal RH1002. 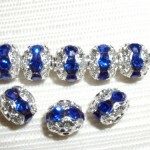 A set of 12 Dazzling Swarovski Rhinestone Filigree beads. 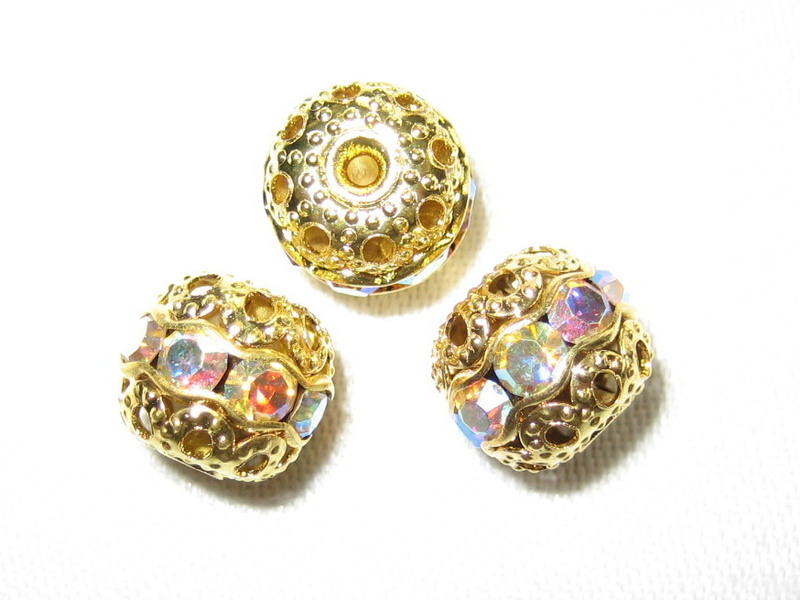 These are 10mm beads with crystal stones on a gold-plated filigree metal base, and with a nice thru-hole ideal for beading. The stones which are set in this quality finding are machine cut and fire polished – foiled back – to give extra rich sparkle. 12 10mm Swarovski Rhinestone Beads Silver/Crystal AB — RH1003A set of 12 Dazzling Swarovski Rhinestone Filigree beads. These are 10mm beads with crystal stones on a silver-plated filigree metal base, and with a nice thru-hole ideal for beading. The stones which are set in this quality finding are machine cut and fire polished – foiled back – to give extra rich sparkle. 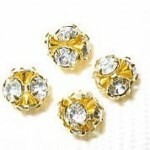 8 6mm Swarovski Rhinestone Filigree Balls Gold/Crystal AB – B604.A set of 12 Dazzling Swarovski Rhinestone Filigree beads. These are 10mm beads with crystal stones on a gold-plated filigree metal base, and with a nice thru-hole ideal for beading. The stones which are set in this quality finding are machine cut and fire polished – foiled back – to give extra rich sparkle. 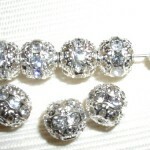 12 10mm Swarovski Rhinestone Beads Silver. 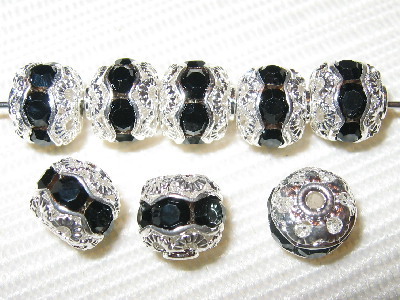 A set of 12 Dazzling Swarovski Rhinestone Filigree beads. These are 10mm beads with clear color crystal stones on antique brass-plated filigree metal base, and with a nice thru-hole ideal for beading. The stones which are set in this quality finding are machine cut and fire polished – foiled back – to give extra rich sparkle. 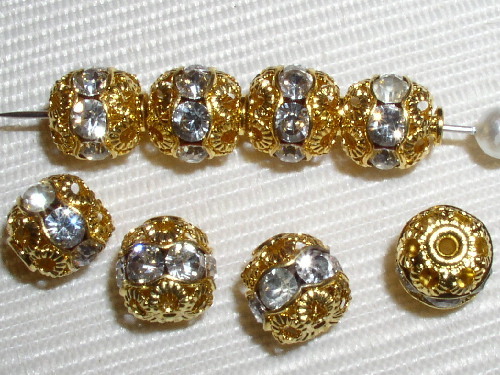 A set of 12 Dazzling Rhinestone Filigree beads. 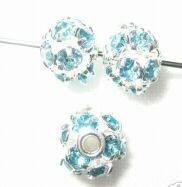 These are 8mm beads with crystal stones on a silver-plated filigree metal base, and with a nice thru-hole ideal for beading. The stones which are set in this quality finding are machine cut and fire polished – foiled back – to give extra rich sparkle. Add elegance and sparkle to your jewelry, crafts, ornaments or costumes designs! 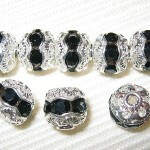 A set of 12 Dazzling Swarovski Rhinestone Filigree beads. 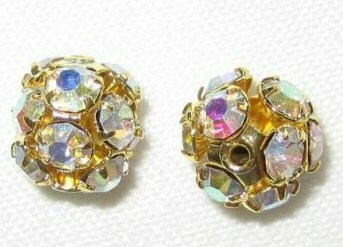 These are 8mm beads with crystal stones on a gold-plated filigree metal base, and with a nice thru-hole ideal for beading. The stones which are set in this quality finding are machine cut and fire polished – foiled back – to give extra rich sparkle. 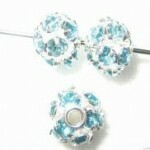 Product Description A set of 12 Dazzling Swarovski Rhinestone Filigree beads. 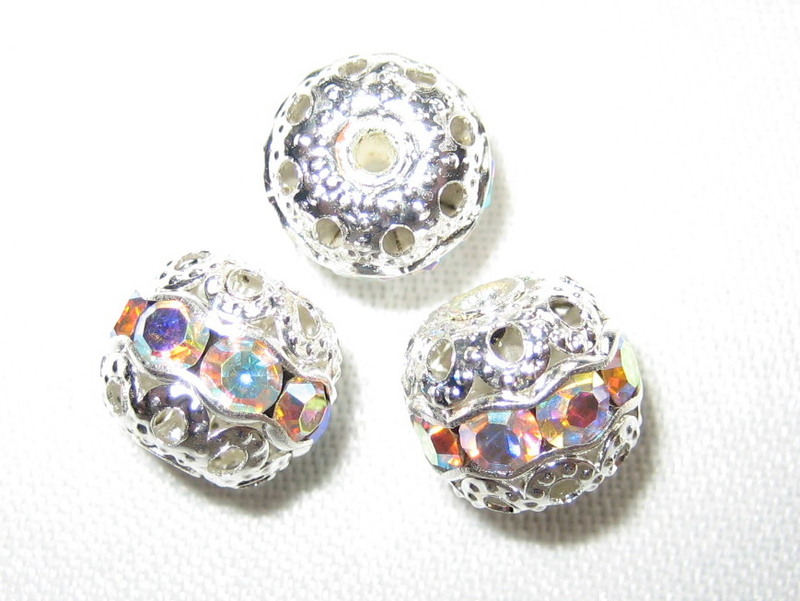 These are 8mm beads with crystal stones on a silver-plated filigree metal base, and with a nice thru-hole ideal for beading. The stones which are set in this quality finding are machine cut and fire polished – foiled back – to give extra rich sparkle. 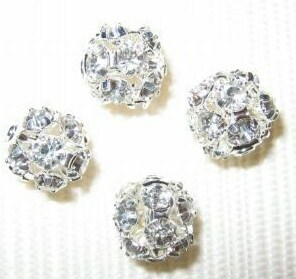 12 8mm Swarovski Rhinestone Beads Silver. 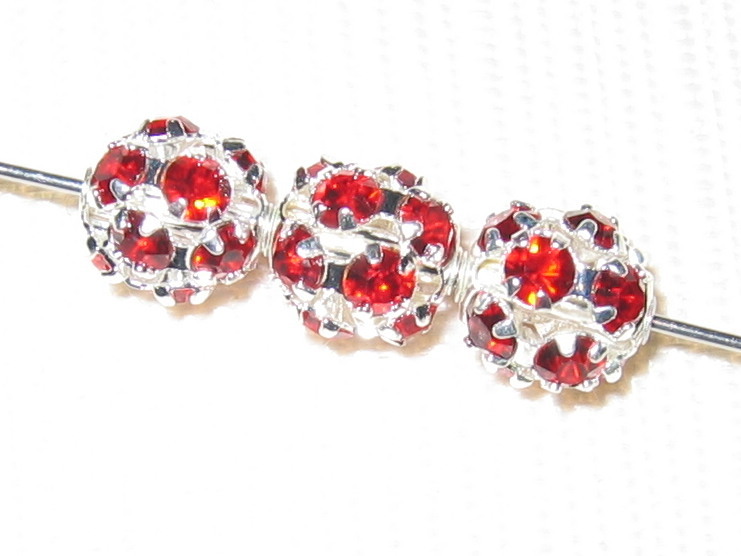 A set of 12 Dazzling Swarovski Rhinestone Filigree beads. 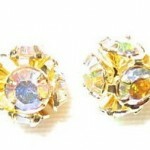 Rhinestone Color: Rose Pink, Sapphire, Emerald, Siam, Jet Black and many more. 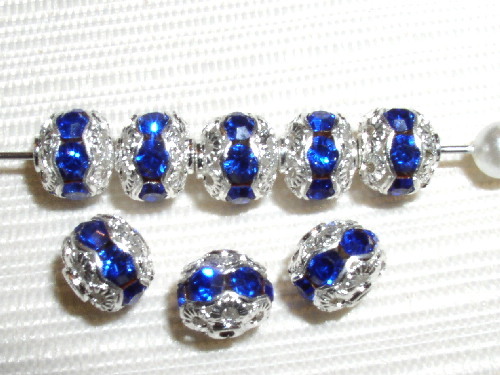 A set of 12 Dazzling Swarovski Rhinestone Filigree beads. 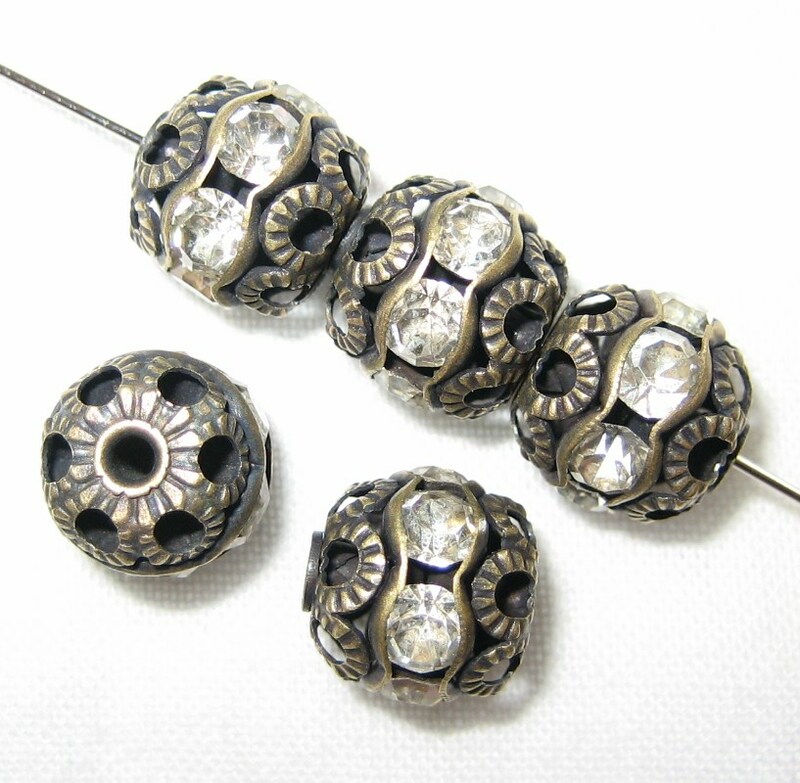 These are 8mm beads with clear color crystal stones on antique brass-plated filigree metal base, and with a nice thru-hole ideal for beading. The stones which are set in this quality finding are machine cut and fire polished – foiled back – to give extra rich sparkle. Add elegance and sparkle to your jewelry, crafts, ornaments or costumes designs! A set of 12 Dazzling Rhinestone Filigree beads. These are 6mm beads with crystal stones on a silver-plated filigree metal base, and with a nice thru-hole ideal for beading. The stones which are set in this quality finding are machine cut and fire polished – foiled back – to give extra rich sparkle. Add elegance and sparkle to your jewelry, crafts, ornaments or costumes designs! 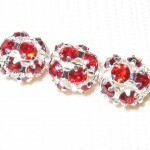 A set of 12 Dazzling Swarovski Rhinestone Filigree beads. 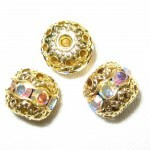 These are 6mm beads with crystal stones on a gold-plated filigree metal base, and with a nice thru-hole ideal for beading. The stones which are set in this quality finding are machine cut and fire polished – foiled back – to give extra rich sparkle. 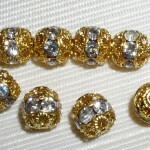 A set of 12 Dazzling Swarovski Rhinestone Filigree beads. These are 6mm beads with crystal stones on a silver-plated filigree metal base, and with a nice thru-hole ideal for beading. The stones which are set in this quality finding are machine cut and fire polished – foiled back – to give extra rich sparkle. 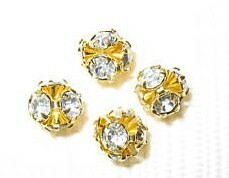 A set of 12 Dazzling Swarovski Rhinestone beads. These are 6mm beads with clear color crystal stones on antique brass-plated filigree metal base, and with a nice thru-hole ideal for beading. The stones which are set in this quality finding are machine cut and fire polished – foiled back – to give extra rich sparkle. 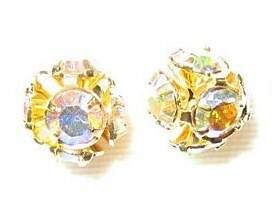 8 6mm Swarovski Rhinestone Filigree Balls Gold/Crystal B602. 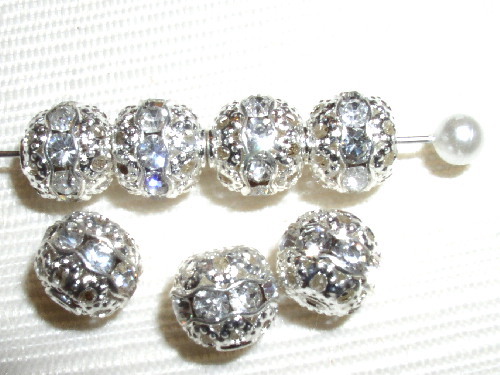 8 6mm Swarovski Rhinestone Filigree Balls Silver/Crystal AB – B603. 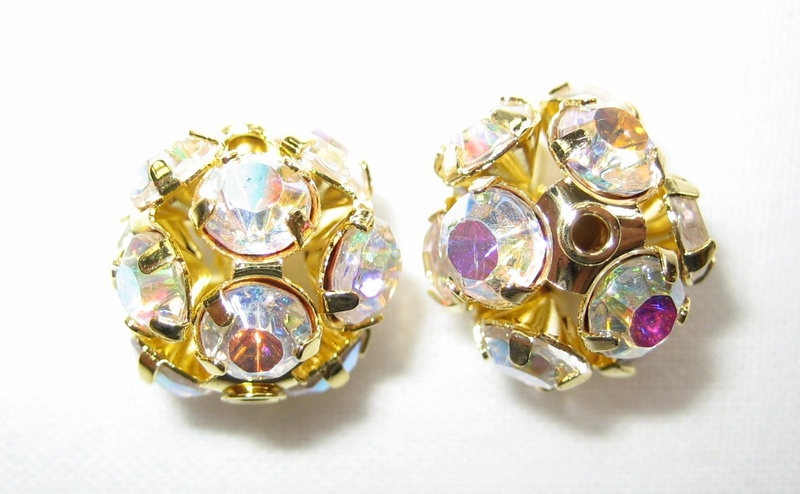 8 6mm Swarovski Rhinestone Filigree Balls Gold/Crystal AB – B604. 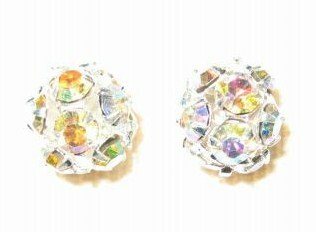 8 6mm Swarovski Rhinestone Filigree Balls Silver / Color Crystal. Colors available are- Amethyst, Aquamarine, Emerald, Jet Black, Light Sapphire, Peridot, Rose Pink, Ruby, Sapphire, Topaz and Olivine. 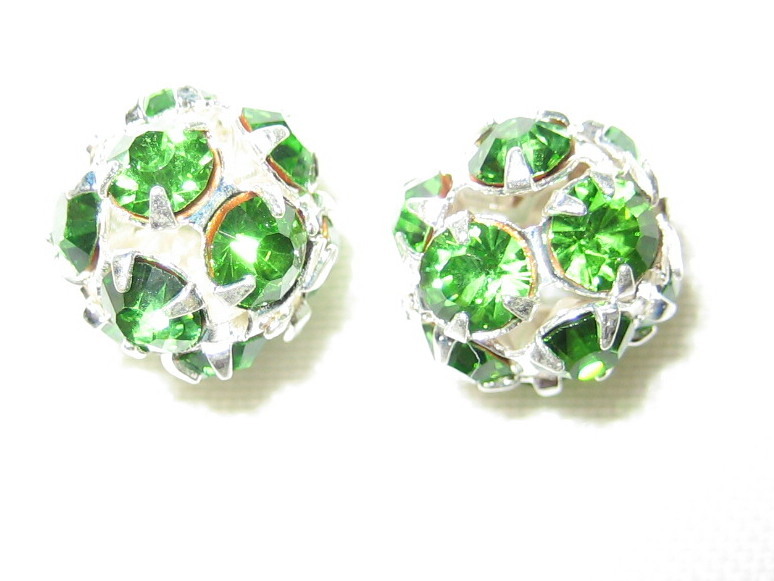 8 8mm Swarovski Rhinestone Filigree Balls Silver / Color Crystal. Colors available are- Amethyst, Light Amethyst, Aquamarine, Emerald, Jet Black, Light Sapphire, Peridot, Rose Pink, Ruby, Sapphire and Topaz. 8 10mm Swarovski Rhinestone Filigree Balls Silver/Crystal B1001 8 10mm Swarovski Rhinestone Filigree Balls Gold/Crystal B1002. 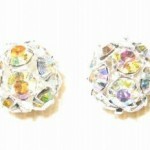 8 10mm Swarovski Rhinestone Filigree Balls Gold/Crystal AB – B1004. 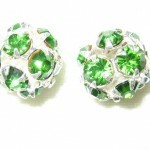 8 10mm Swarovski Rhinestone Filigree Balls Silver / Color Crystal. Colors available are- Amethyst, Light Amethyst, Aquamarine, Emerald, Jet Black, Light Sapphire, Peridot, Rose Pink, Ruby, Sapphire and Topaz. 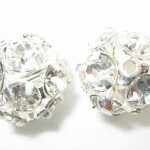 8 12mm Swarovski Rhinestone Filigree Balls Silver/Crystal B1201. 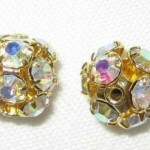 8 12mm Swarovski Rhinestone Filigree Balls Gold/Crystal – B1202. 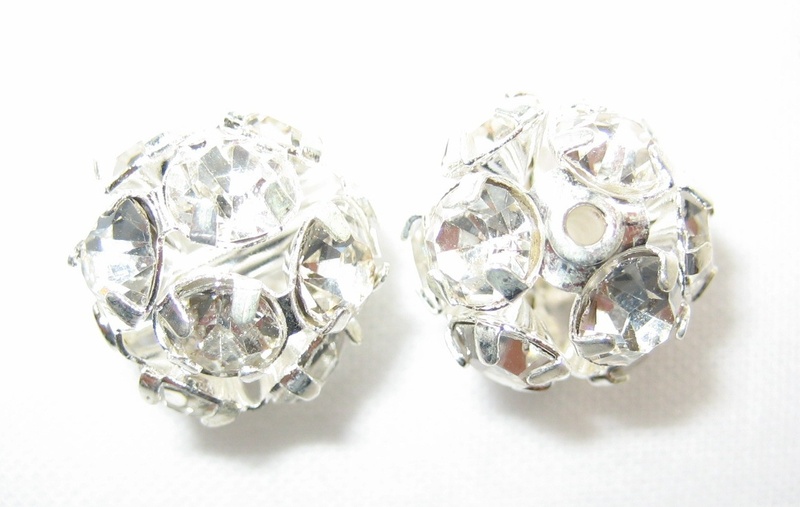 8 12mm Swarovski Rhinestone Filigree Balls Silver/Crystal AB – B1203. 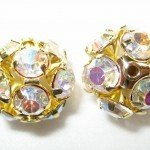 8 12mm Swarovski Rhinestone Filigree Balls Gold/Crystal AB – B1204. 4 14mm Swarovski Rhinestone Filigree Balls Silver/Crystal – B1401. 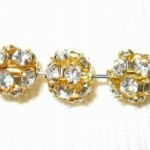 4 14mm Swarovski Rhinestone Filigree Balls Gold/Crystal – B1402. 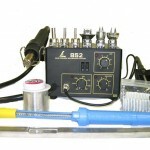 35 watt soldering iron ..
24 volt output to prevent circuit damage from the iron..
long life heat element made from anti-static materials to protect sensitive components. b001 soldering iron, 30150j heat resistant pad, 201843 flat tweezers tip and 201842 pointed tip. $250. Comparing to Ebay price, it is really a good deal! purchase comment part so that we can ship you right items. 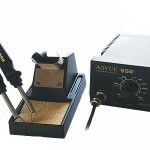 This portable, spring-loaded tool removes solder around component leads in PC board holes during desoldering applications. 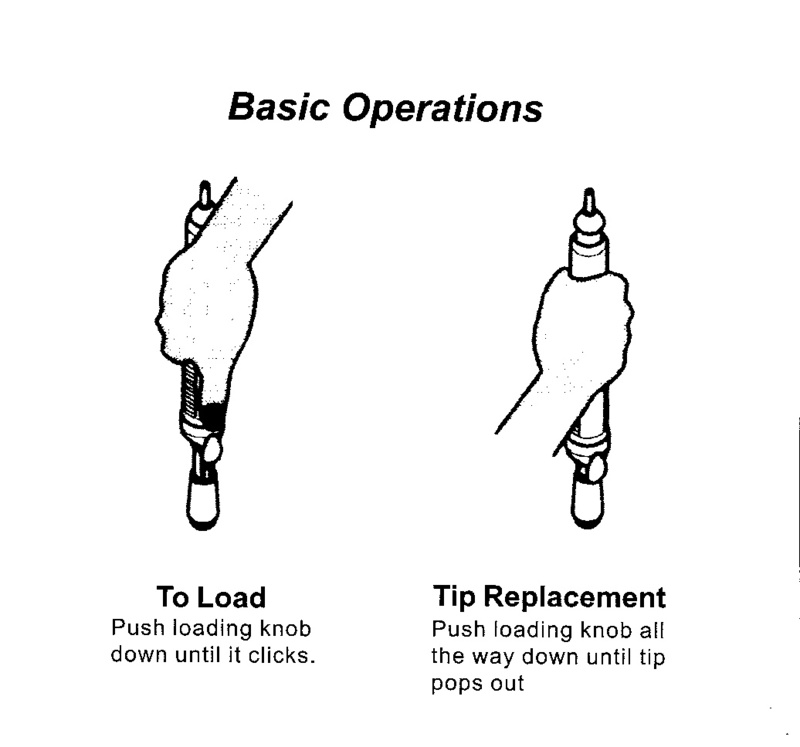 Simple-push-button trigger allows for easy one-hand loading and operation. 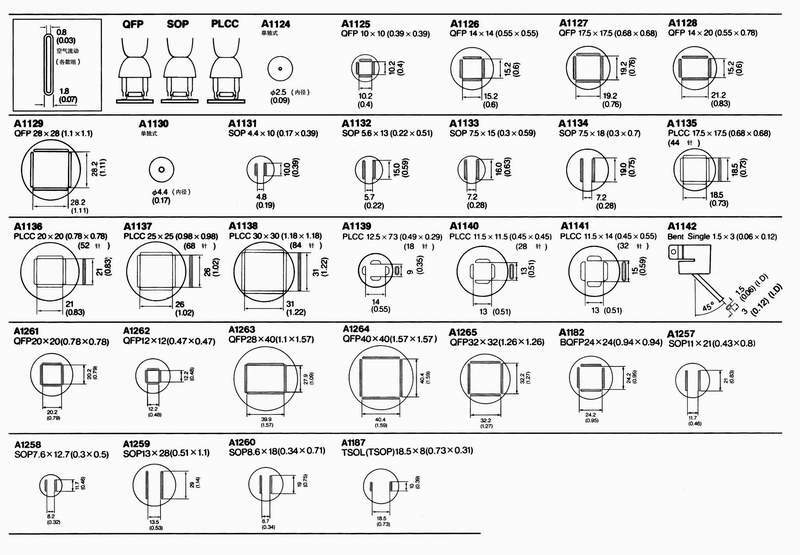 1/8″ I.D. 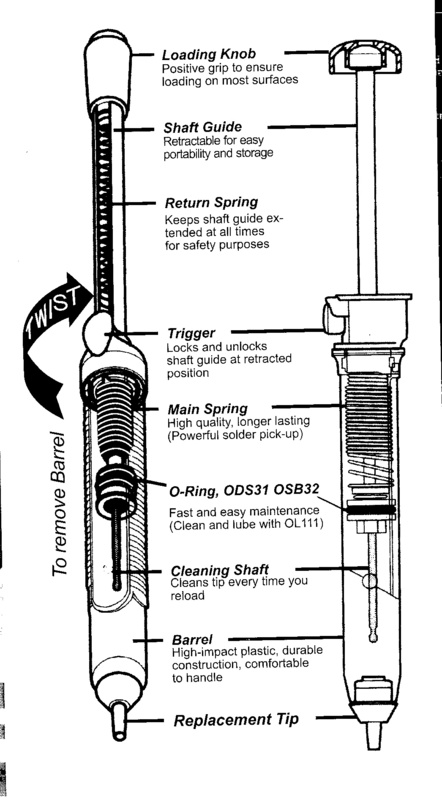 Teflon tip self-cleans each time pump plunger is depressed. Deluxe Model DS017 is made of high-impact plastic. All In One Station! Hot Air, Vacuum Pump, Soldering Gun. .!!! 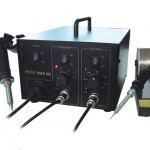 De-soldering gun with vacuum pump..
Air Flow gauge and knob adjustment for the hot air flow..
Microprocessor precisely controls temperature and airflow..
Digital display of hot air set and actual temperature as well as its airflow.. 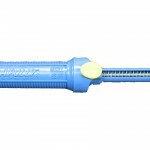 Hot Air Gun is also designed with a unique 15-minute stand-by auto sleep mode. 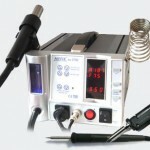 It will return to the previous setting when the handle is lifted up again..
Auto cool-off process that leaves the blower on until the nozzle is cool, this prolongs life of the heating element and to ensure safety..
Maintains a constant set temperature when the set and the value is reached..
Lead Free Type Soldering Iron – heats up very quickly and has a smoke absorber..
852D, 852D+ in our website. 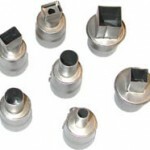 Welcome to call in or email for inquiry.